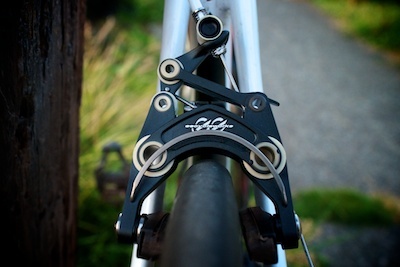 Front brake on Hed’s wide, C2-based whee. Note: parallax makes the tire look closer to the brake then it is. 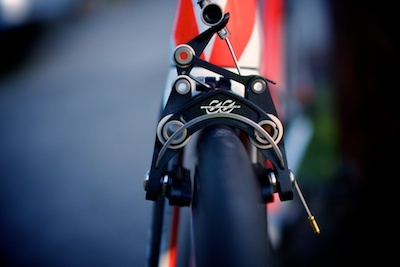 Pads and bits included, these EE brakes weigh in at 189 grams, which is 40% less than SRAM Red brakes. That’s not the main feature though. It’s the exponential, modulating braking power from the pivots, levers, and smooth action from the self-lubricating plastic micro disks. They also look different: complicated and bedazzling. 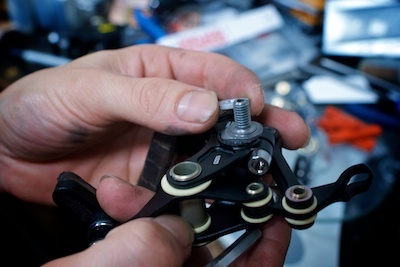 Brake bling for your bike. 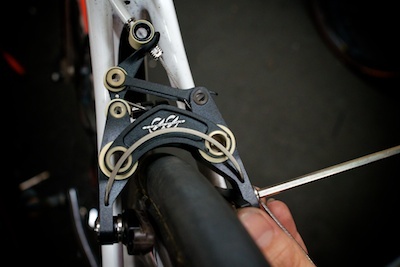 If you pull your brake levers with varying strength to scrub speed going into the apex of a corner or a hard stop into a stop sign at the bottom of the hill, then you’ll likely agree that EE brakes are better than SRAM or Shimano. Your bros will love or hate how they look and at $589.00 per set these are for your best race bike, like cufflinks on a tailored shirt. Mark installed the brakes on our Specialized S-Works Venge we’ve got on long-term test that and built out for about 1/2 the cost of the Mclaren Venge.I also wanted to get this post out before Cross season starts, cause we’ve got plenty coming on that too including CrossVegas this week and Starcrossed. See more photos of the Venge first on G+. Follow me there. Also find high-rez version of these photos on Flickr.